Continuing my goal to write about comics I'm currently reading, I herein give you my take on the latest Black Lightning comic from DC. I know very little about the character Black Lightning. The only comics I remember reading that he was in are the first year or so of Batman and the Outsiders. I'm not sure what the origins of the character are, other than he was created by Tony Isabella, who writes this series. With all the reboots in DC continuity, I'm not sure if Black Lightning even has a current origin story. And speaking of Mr. Isabella, I promise not to be prejudiced because Tony is one of my Facebook friends, an Ohio resident, and a guy I've talked to at many comic cons going back to when I was a teenager. I will admit I might be prejudiced by Tony being a super nice guy! 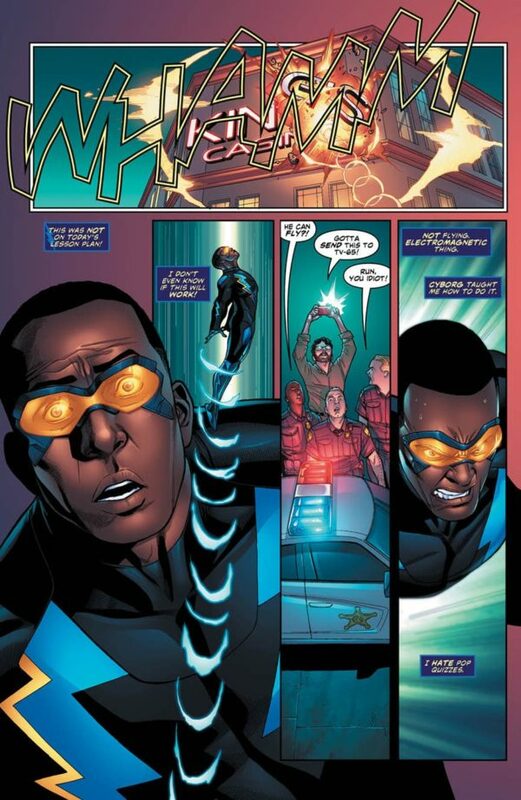 By the way, Black Lightning has electrical powers--which should be obvious--including being able to hurl lightning, having a force field, and manipulation of electromagnetic forces, which allows him to somewhat fly and levitate heavy things. He's also a teacher when he isn't in costume, which is a big part of his personality and I, of course, approve! Anyway, the first issues centers on a group of thieves called the "Weathermen" who are using high-tech guns to rob places in Cleveland and cause all kinds of mischief. You read that right, by the way. Unlike most DC heroes who are based in fictional cities, BL isn't patrolling the streets of "Laketown, Midwest" or some such, but is in the real city of Cleveland. Anyway, over the course of the issue or hero, of course, does his job and stops the bad guy (I leave out details to encourage everyone to go buy the book!) but it isn't easy. First, because this is all part of a master plan by a big bad guy. And second, because the local law enforcement is split on whether they want BL to help, or BL to go to jail. This latter plotline is what gives this story more depth than your typical super-hero affair. As the cover says: "A hero for today's headlines" ,and our hero has to deal with the attitudes of police and public towards BL and his actions. There's real tension and the question of if that tension is caused by anti-vigilantism feelings alone, or is there some racism thrown in there to boot? And it looks like things will only get more heated as the series continues. Needless to say, I really enjoyed this book. One of my favorite comics I've read this year and a great example of how to write a good super-hero story! And the art by Clayton Henry is very nice! Slick and exciting and great storytelling! So I thought I'd take a look at some of the comics I'm currently enjoying, starting with my current favorite Marvel, the Champions! I think what I really like about the Champions is that it is about the next generation of Marvel heroes. This is interesting because the characters are young and trying to be heroes in a world where super-folks are well established. This reflects the classic Marvel comics of the 60's that it deals with people new to being heroes, but it also deals with this as a continuation of the classic Marvel comics, not a reboot. I'm not a big fan of reboots because they always end up telling the same stories that were told originally all over again. And that's just not very creative, I think. I'm probably least interested in the new Hulk, Amadeus Cho. He's the smartest and can Hulk-out and become strong and invulnerable. No real downside to this. The Viv Vision is okay, but doesn't really differ much from the Vision. Still, she gets into some interesting situations, and I think this is a good example of doing well with a rather dull character. Cyclops is more fun than I thought he would be. This is Scott Summers as a time-displaced teen. Much more interesting than the adult character has been in years. Spider-Man, Mile Morales is almost as interesting as Peter Parker was as a teen. Nova is a blast. He's very unsure of himself despite being very powerful. I always thought the original Nova character was fun, and since he never became more than a B-level hero, he's a good character to revisit by having the legacy passed on to a younger character. But by far my favorite is Ms. Marvel! Kamala Khan is just amazing! She's powerful, but not overly so, and she's very optimistic usually, yet she encounters a lot of hardship. Mostly her interactions with Nova and Spider-Man make the Champions such an entertaining book. Okay, I know that's brief. Maybe I'll add more as I catch up reading the Champions. I have a couple issues in my "to read" stack.